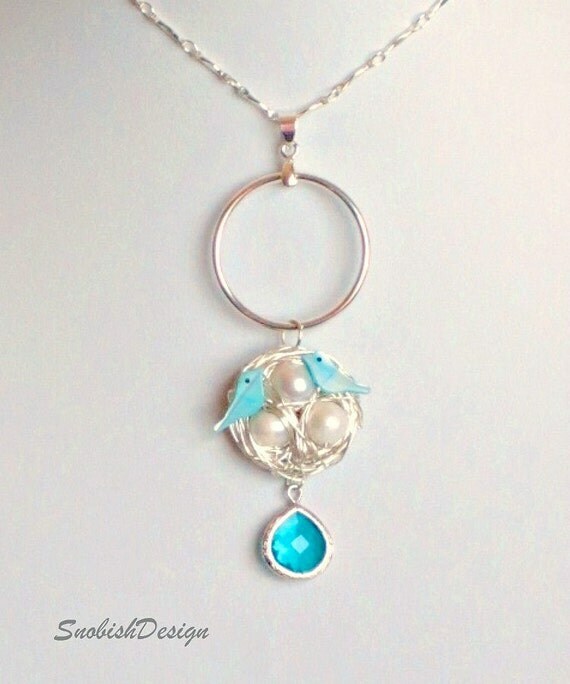 Beautiful handmade pendant necklace features a handcrafted silver birds egg nest complete w/ 3 eggs of fresh water pearl and 2 turquoise pearl bird beads guarding their nest. A silver circle is linked to the top of the nest and a Blue Zircon pendant to the bottom forming one big drop pendant. The drop pendant hangs nicely from a sterling silver chain closing with a silver lobster clasp at the back. For a tad of pizzazz I wire wrapped a Swarovski turquoise blue bead to the clasp. The wire used in making the nest is non tarnish high quality German silver wrapping wire. The eggs can represent children, pets, friends what ever you like. Folksy :: Buy "All About The Owl Silver Pendant Necklace"
Folksy :: Buy "Handmade Wire Birds Nest Pearl Necklace Silver"